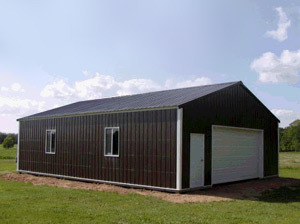 Post frame buildings are an economical and versatile solution for providing protection from the forces of nature. 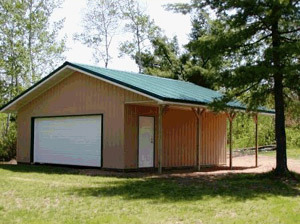 Your building can be used for cold storage or have a finished interior for a heated shop. Our standard structural design offers the ability to change an unfinished interior into a finished interior at a later date. With the use of posts or columns the height of the building can be adjusted to fit almost anything. Steel roofing, siding and trim are available in several colors for a exterior styling that is simple or intricate, achieving the appearance you desire. After the completion of the structure the interior floor of your choice can be installed. Lets get started on your building today, give us a call.